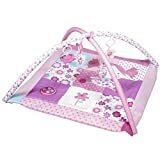 This padded play mat and gym from Red Kite lets your little one get lost in a pretty in pink Princess design both in and out of the house. Suitable for a wide variety of activities for visual and tactile stimulation, included within the mat are ‘hidden’ squeakers and crinkle fabrics for playtime. There is a detachable toy bar with extra hanging toys, making this mat the perfect new setting for your child’s wondrous adventures and a great gift idea. Great Tips That Will Help You Get Fit And Look Amazing! Look No Further The Best Tips About Weight Training Are Right Here!